Learn to recognise badger field signs, and enjoy a sense of close proximity to badgers without ever seeing the animals. 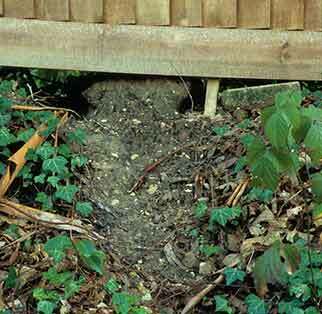 Badger setts often have a large number of entrances - sometimes in excess of 40. To assist drainage, Badger setts are often on sloping ground, and in the New Forest, many are near grassland or cultivated land which provides a better prospect of food than the relatively infertile New Forest soils. 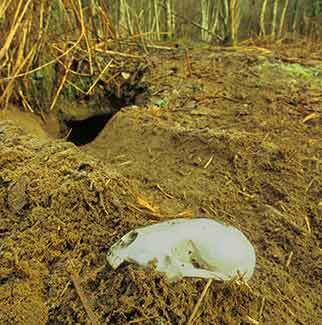 Badger sett entrances are noticeably bigger than rabbit burrow entrances. Spoil heaps, too, are often large, with furrows down the centre that mark the route used during excavation and subsequent, repeated Badger passage. Badger-created undulations are often visible on both sloping and otherwise flat ground – these are the sites of old spoil heaps. Look out, too, on the spoil heaps for bones excavated from deep underground where past Badger generations have died. 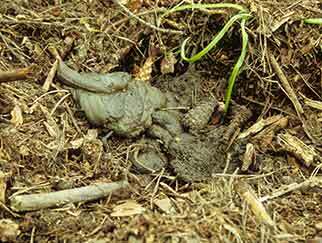 Badgers are tidy animals that use shallow pits, latrines, in which to deposit their often stodgy droppings. These latrines are often located near the sett, and also occur around territory boundaries where they give notice of occupation to potential Badger intruders. 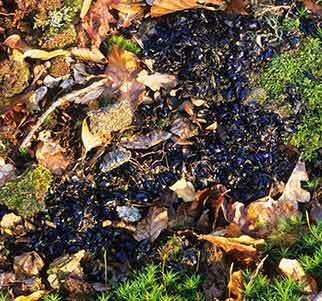 Content and appearance of Badger droppings reflect diet. Two examples are illustrated here. The first is fairly typical, whilst the second, containing large numbers of beetle wing cases, is much less so. Badgers are stocky animals that leave relatively large footprints. 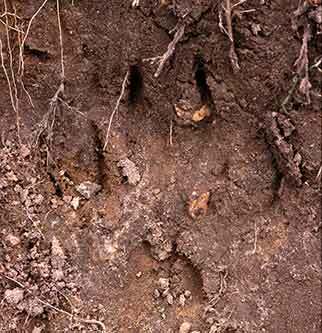 The outline of all five toes is often visible, whilst strong, lengthy claws usually leave deep gouge marks in the mud. Look out also for Badger claw marks on tree trunks and stumps around the sett – Badgers habitually leave deep scratches in fallen and standing timber. Badgers are incredibly strong, habitual diggers. Much to the annoyance of owners, fences are regularly dug through or under. On regularly used routes, blocking the way – as has been attempted here with the right-hand gap – is often to no avail as the Badger simply digs and damages again. In Britain, badgers are one of the hedgehog’s few, regular natural predators. 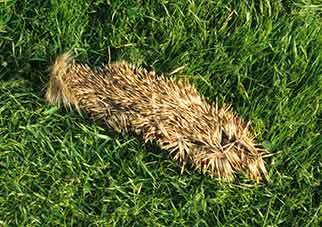 Look out for hedgehog skins and spines, the remains of a tasty badger meal. 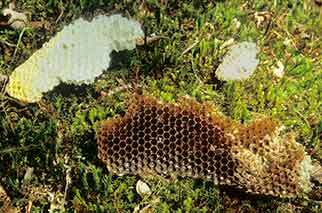 Badgers regularly attack bees’ nests – the Badgers eat the larvae, pupae and stored honey, and leave damaged honeycombs as evidence of their work.